Sturdy table easel styled after the H-frame studio easel. Base measures 11" wide by 12-1/2" deep. Holds canvas up to 21 inches high. Minimal assembly required. Individually boxed. The Pro Art easel box is easy to carry and measures 17"L x 13"W x 3"D. Includes free 11" x 15" wood palette. The lid will tilt and is secured with brass bolts. The canvas clamp will hold canvas or boards up to 26" securely in place. Adjustable bottom register allows it to easily handle small scale panels as well. 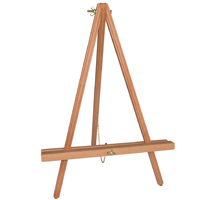 Made from oil rubbed beechwood this lightweight easel features non-skid rubber feet and stability chain. Easel stands 22" high, adjustable tray is 15" wide.